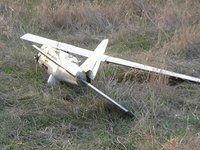 Ukrainian servicemen shot down an unmanned aerial vehicle (UAV) of militants in the Avdiyivka sector, its elements were transferred to specialists for identification. In the Avdiyivsky sector, the enemy's UAV was flying over the positions of the Ukrainian units in order to clarify the development of the defense system and detect the fire system of the JFO, the Joint Forces Operation (JFO) staff said on Facebook on Monday. "Thanks to the coordinated actions of observers and calculations of on-duty fire weapons, the provocation was stopped, and the enemy's yet another UAV was destroyed. The remains of the shot down UAV were transferred to specialists of special units for study and identification," the report said.